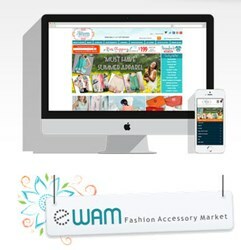 Founded in 2000, family-owned Wholesale Accessory Market (eWam) started in a one-car garage and has become one of the nation’s largest fashion accessory wholesaler and retailers. It now offers over 50,000 products and continues to grow its SKUs. Their primary customer base is fashion boutiques and salons, as well as self-employed independent distributors. With a holiday season that begins in September, eWam needed to improve its ecommerce capabilities and shore up its back- end processes to keep pace with growth rates. eWam, focused on growth in revenues and customer service, has some unique self-imposed restrictions. Steven Roper, CEO, explains “We close at 5pm so employees can see their families at night, and we close on Sundays so that our workers can enjoy a day of rest.” The company realized it needed the most effi cient ecommerce platform and order management system available in order to compete with companies running three shifts, 24/7. Download the full case study below to read more.